Ha! You thought I would forget, didn't you? Wrong! This will be short and sweet. I think. Anyway, did I ever tell you that Conor is color blind? Well, not totally. Just a little red/green color blind. He can still see some reds and greens, just not all shades. With Jeff's help, I was able to talk him out of them. I took the picture and sent it to Jeff and he called and talked to Conor. I don't really think they are that ugly... they just wouldn't match anything! OK, yeah, I do think they are that ugly. Are you worried yet mayo?!?! Mwahahahahaha. You know you made it a challenge, right? And I don't like to lose. Anything goes these days. I think they are kind of cool looking. You should have bought them for him. He told me green was his favorite color. Green goes with everything, doesn't it? It's only Day 8 K, you got a LONG way to go! 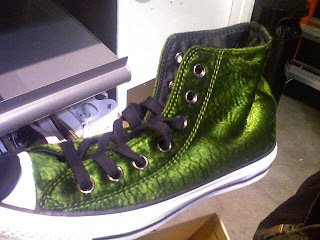 I agree.....those are ugly! And No! I didn't know he was color blind! My mom was too just a little bit...which explained some of the colors she chose for the knitting she did.